Banner 0519 Steampunk Rocket. As usual, contact me for signed prints or legal permission. Banner 0511 Coit Tower. Before you do anything, contact me for signed prints or legal permission. Banner 0054 Art Deco Justice. Before you do anything, contact me for signed prints or legal permission. Golden Gate Bridge from the west. As usual, contact me for signed prints or legal permission. 1. A new logo, look and design to increase visibility across lighting conditions, browsers, platforms and devices. 2. A new menu structure and columns to find jobs and meetings. 3. New banners with pictures of people at STC events, keyboards (from keypunch to iPhone), and other technology specific to Silicon Valley like semiconductors, silicon wafers, satellite dishes, etc. 5. Ad space on the Home page with a sample ad clickable to Ad submission form. 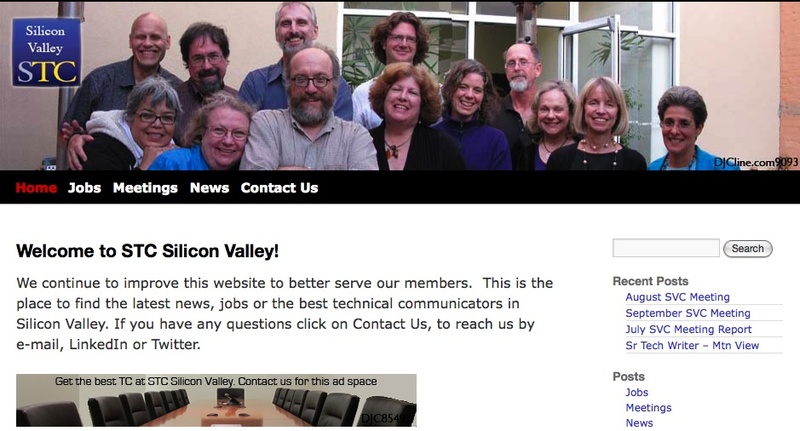 If you want to reach the best technical communicators in Silicon Valley. Place an ad on this site. Also, on August 25, 2011, the meeting hosts Jack Molisani’s presentation “When Your Ship Comes In ” at the Redwood City Chevy’s, located at 2907 El Camino Real Blvd in Redwood City. The meeting starts at 6 PM. See you there. Banner 0022: B-17 Bomber. Copyright 2011 DJ Cline All rights reserved. Obviously it is spring and I started photographing flowers. Maybe you can tell me what kind of flower this is. Copyright 2011 DJCline All rights reserved. On April 19, 1996 I uploaded the one of my earliest banners for my website. Someone reminded me I’ve been doing regular posts for about fifteen years so I thought I’d put this up. It’s me on a trip back home that looks part Roadrunner cartoon and part Twilight Zone. Before the website, I used to send out e-mails and printed newsletters but the website got the widest circulation. This current version designed by Doug Wray has been in daily operation for seven years. Like me, it keeps changing and keeps going. Can’t stop the op.